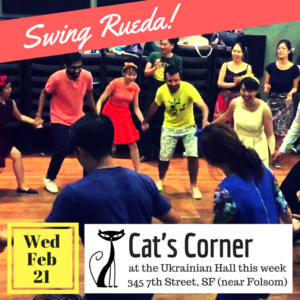 February 21, 2018: One Night Swing Rueda Workshop & Party at Cat’s Corner / Ukrainian Hall! – Swing or Nothing! 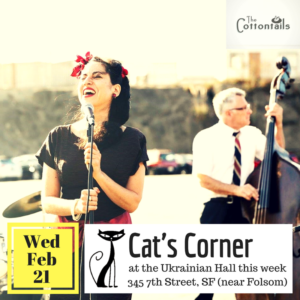 Find Cat’s Corner at the Ukrainian Hall in SOMA, SF for one night only (while main venue closes for a private event). Intermediate and above. You must know the swingout, lindy circle, charleston and basic 8-count turns. $20 drop-in online or door. $10 at door if enrolled in classes at Swedish Hall. Includes dance party admission. No partner or experience needed. Beginners welcome! FREE with dance party admission. 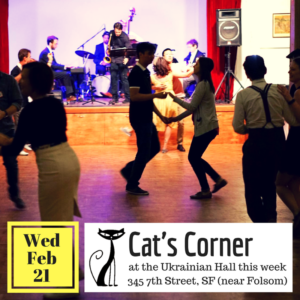 Dance-only admission cost: $10 -or- $5 before 9pm or after 11pm. Guests welcome to bring their own beer, wine and spirits to enjoy and share. We will provide mixers, recipes and guidance to prep your own fancy cocktails! 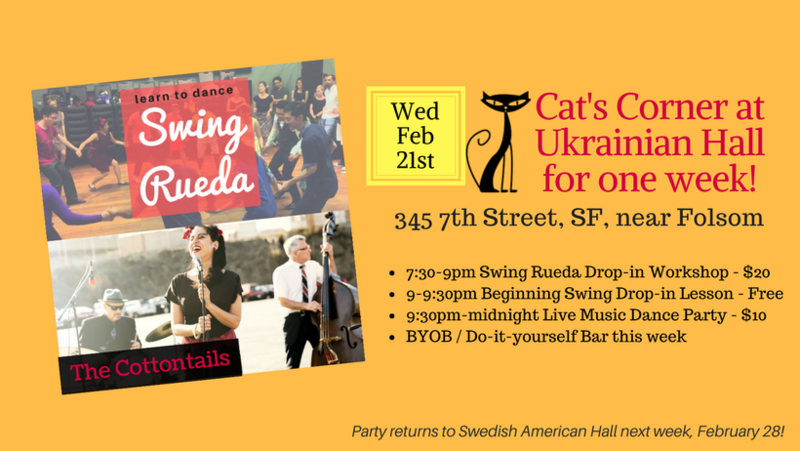 ← Where to swing dance on New Year’s Eve 2017!